Traveling to Japan? Then learning the language is at the top of your list and "JAPANESE in 10 minutes a day" is the best way to prepare for your trip! 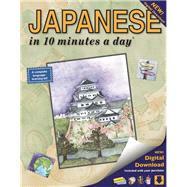 This complete program combines the ever-popular "JAPANESE in 10 minutes a day" Book with interactive softwareit's the perfect blend of education and entertainment. Computer activities such as interactive Sticky Labels, Flash Cards and games add a playful twist to learning the language. With your new skills, you'll be able to shop the Ginza, see the sights and make reservationsall in Japanese! Now you're ready for the trip of a lifetime! Perfect for students, international executives and inspired travelers wishing to participate in this rich and ancient culture. The 10 minutes a day” proven methodology guarantees successall you have to do is set aside 10 minutes and you’ll be on your way. Why 10 minutes a day? Because 10 minutes is doable, it fits easily into your life and it’s not overwhelming. The program is created so that you can work at your own pace. You set the pace and you decide when you’re ready to move to the next Step. The book is purposely designed to look like a child’s workbookit’s not intimidating or overwhelming. Instead, it’s approachable and engaging for everyone at any age. The book covers material equivalent to more than a year of high school Japanese or the 1st quarter of Japanese at university. The vocabulary hones in on key essential words that you’ll actually use when traveling. You’ll learn Key Question Words so you can ask for what you need; money and numbers so you can shop and pay bills; directions so you can get to your destination smoothly, and so much more that will make your experience abroad enjoyable. Study aids and fun activities such as word games, puzzles and interactive modules are academically designed and strategically interwoven into the program to help you succeed. The 132-page illustrated workbook: Use the book to guide you, step-by-step, through learning and speaking Japanese. Full color throughout: Visually engages you and is conducive to learning quickly. 150 Sticky Labels (both in the book and for your computer): Place the Sticky Labels around the house and office to learn new words without any extra time or effort. Use the interactive Sticky Labels module on your computer to hear the words, review, keep track of your score and improve. Ready-made Flash Cards (both in the book and for your computer): Take the ready-made flash cards with you and review your vocabulary on the go. Use the interactive Flash Card module on your computer to hear the words, practice and test yourself. Cut-out Menu Guide: Practice at your local restaurant and take it on your trip. Pronunciation Guide: With the Guide and simple phonetics above each Japanese word, it’s easy for native English speakers to begin speaking Japanese with the correct pronunciation. Over 300 "Free Words:" Sounding similar to their English counterparts, these Japanese words take no extra effort to add to your vocabulary. Glossary of over 2,000 new words, definitions, and pronunciation: So you can quickly look up a Japanese word, its pronunciation and definition. Kristine K. Kershul blends her experience as a teacher, world traveler and language scholar to create a playful, innovative way to learn and use a new language. Teacher: As an expert linguist, Kristine spent ten years teaching German at universities in the United States and in Europe. World Traveler: An adventurous spirit, Kristine has explored more than 100 countries, from Bhutan to Zimbabwe, and almost every exotic locale in between. She understands the problems that all travelers encounter, regardless of which country they are visiting. She knows first-hand how languages can open doors to new adventures, new friends and different cultures. Language Scholar: Kristine completed her undergraduate and graduate studies while living in Heidelberg, Germany. She then received a second Master's Degree from the University of California in Santa Barbara and subsequently, did her Doctoral studies in Medieval German Languages and Literature. In addition to German, she also speaks a number of other languages ranging from Arabic to Swahili. A Colorful Background: Kristine's fascination for languages began as a child growing up in a tri-lingual household in Oregon, where Croatian, Danish and English were spoken. Kristine's natural gift for languages opened doors outside the academic world. She worked as a bilingual travel guide in Europe and later, as a translator at the U.S. Embassy in Germany. On A Personal Note: Kristine's passion for travel, foreign languages and new cultures continues to take her around the world. One never knows where she'll venture to next - Namibia, Laos or Guyana. Kristine is a licensed pilot, a certified diver and an avid downhill skier. She enjoys competitive horseback riding and playing the piano. She makes her home in both Seattle, Washington and in Cape Town, South Africa.